An attack by fast-spreading malicious code targeting computer servers has dramatically slowed internet traffic. The attack - by what is known as a computer "worm" - has interfered with web browsing and e-mail delivery. 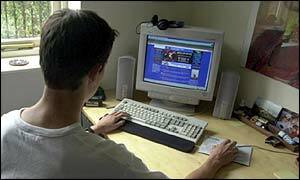 Computer experts said the slowdown on Saturday was similar to the impact of the "Code Red" virus, which brought internet traffic to a halt in the summer of 2001. The malicious code targets servers that direct traffic on the internet and does not infect home computers. In South Korea internet services were shut down nationwide for hours on Saturday, the country's Yonhap news agency reported. The code instructs the server to go into an endless loop, continually sending out data to other computers, in effect performing a denial of service attack, BBC News Online technology reporter Alfred Hermida says. The malicious code - which is only 376 bytes in size - started to significantly attack the web at about 0530 GMT on Saturday. Howard Schmidt, one of President George W Bush's top cyber-security advisers, said the FBI's National Infrastructure Protection Center and private experts at the CERT Co-ordination Center were monitoring the attacks. The South Korean news agency said the nationwide internet shutdown was triggered by "apparent cyber terror committed by hackers". It was not immediately clear if the South Korean attack was the same as that reported in the United States. It is the first time South Korea's wired and mobile internet services have been hit collectively in such a way, according to Yonhap. But the impact on most financial institutions, corporations and government offices was minimal as they were closed for the weekend, it said. The attacking software code overwhelmed many internet data pipelines as it searched for victim computers randomly and aggressively. The code has spread very quickly because it uses a protocol - called UDP - different from the one computers use for accessing web pages. In effect, the code overwhelms servers by broadcasting instructions endlessly, our reporter says. "If you don't then stopping new worms and viruses is as easy as catching smoke in a butterfly net."